Downing College has a unique and magnificent setting amidst 20 acres of lawns and trees, yet is in the very centre of Cambridge. The buildings, which are predominantly neo-classical in style, convey a sense of elegance and spaciousness, enhanced by harmonious proportions, graceful columned porticos, and delicate pink and yellow stone. The College was founded in 1800 under the will of Sir George Downing, 3rd Baronet (1685–1749), and the Royal Charter was issued on 22 September of that year. Sir George’s grandfather gave his name to Downing Street in London and parts of the house which he built still survive in the present number 10. The highly respected Georgian architect, William Wilkins, designed the College around a great quadrangle of 300 feet square. 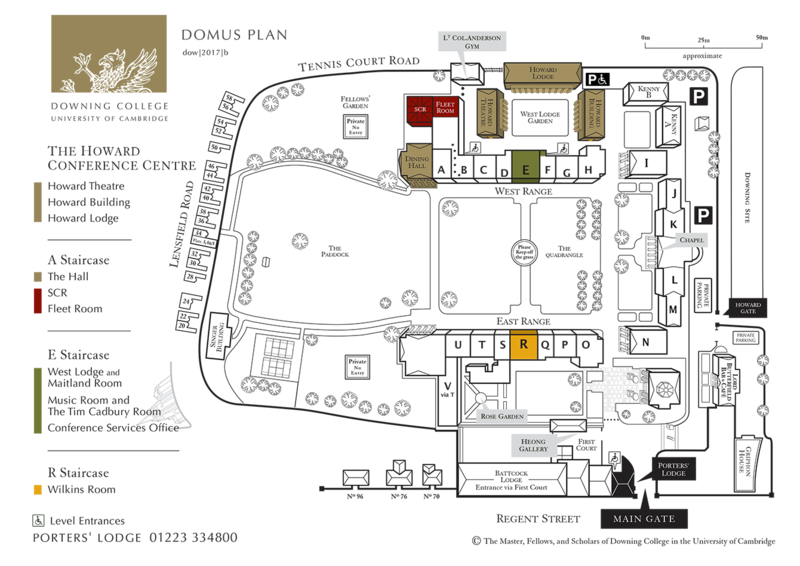 To plan the College on a spacious campus layout was innovatory, and Downing was the first example of this type of collegiate architecture. Building of the College made a complete break with the very enclosed, traditional monastic courts of the older foundations. The whole feeling of Wilkins’ College was to be one of space with buildings set in a landscape. However, only part of Wilkins’ scheme was executed, comprising the West range and majority of the East range, built 1807-21. In 1876 the northern two staircases of the East range were completed to Wilkins' design by the architect E. M. Barry. Much building activity took place during the last century. Between 1929-32 the north corners of the quadrangle were built by Sir Herbert Baker; the north side was completed by A.R. Scott with the construction of the Chapel and two adjacent accommodation blocks in the early 1950s. Kenny Court, named after Courtney Stanhope Kenny, Downing Professor of Law (1907–18), was completed in 1963 (also by Scott), and the award-winning Senior Combination Room followed in 1969 (by Professor W.G Howell), at which time the Hall was also enlarged. The Howard Building (a generous gift from the Howard Foundation) was opened in 1987, and the Junior Combination Room (JCR), named the Butterfield Bar and Café after Lord Butterfield a former Master, was opened in 1989. In 1993 the award-winning Maitland Robinson Library was opened, and subsequently, Howard Court comprising 32 student rooms was completed in 1996, all designed by Quinlan Terry. The stately Hall was also restored in 2009 in homage to Wilkins' original design. In 2010, the Howard Conference Centre was completed consisting of the Howard Building, Howard Lodge and the Howard Theatre, magnificent facilities which enrich the college both academically and commercially. Download our Architectural Tour Guide to immerse yourself in the rich history of the College!